The third annual National Learn To Play Day, on Saturday 12th April 2014, will be offering even more free instrument "taster" lessons to the general public than ever before. It's estimated that 15 million people in the UK would like to play an instrument or would like to start playing again. 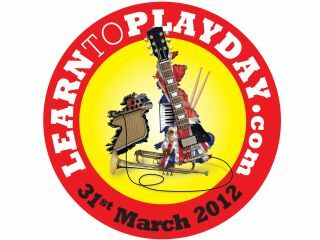 National Learn to Play Day is the ideal way to get back to music and be inspired to get playing. The event is organised by Music for All, the charity of the UK musical instrument industry who will be working hand in hand with its partners, instrument manufacturers, music shops and other venues, celebrities, musicians and many more to encourage anyone and everyone, young or old, to join in this amazing musical learning experience. The 2013 event saw nearly 100 music shops take part across the country, delivering more than 10,000 free lessons to the public. Previous events have seen celebrities like Al Murray and Harry Hill, musicians including Nick Mason (Pink Floyd), Ian Paice (Deep Purple), Doug Aldrich, Brain Tichy and Michael Devin (Whitesnake), Bill Bruford (Yes), Ralph Salmins (Robbie Williams) appearing at their local stores to give music lessons. Check with the website below to find your local participating venue and to see what events they have planned and which celebrities, musicians and local dignitaries will be supporting them. Grab your diary and make sure National Learn To Play Day is in it on Saturday 12th April 2014!